It was a very sad day at Nebo on the 3rd February 1998, Brenin died quietly in his stable after a healthy twenty seven years of life. He was buried near his dam, close to the stable yard. 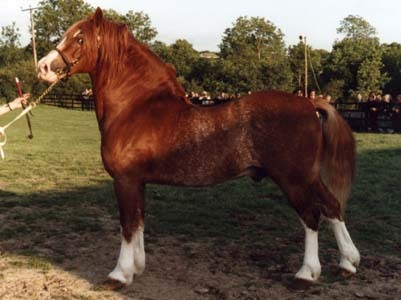 Brenin no doubt was one of the most successful Welsh Cobs that has been bred, not only in the show ring, but also as a sire of substantial stock to the end. His last son at Nebo is Nebo Sion born in 1998. 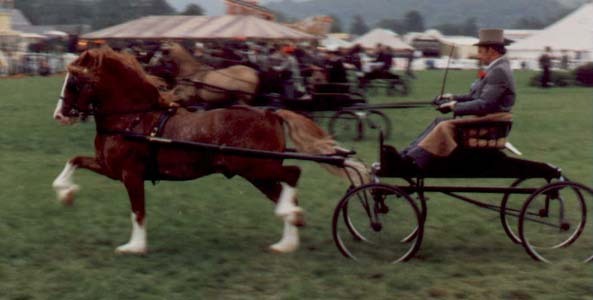 His showing career has been nothing but success having won at most county shows, including the supreme champion at The Lampeter Stallion Show in 1984, his action, quality and temperament excelled him in the driving world, winning the Royal Welsh Show in 1986. Brenin has been a prolific stock getter for us, and also for many other studs, our Welsh Pony and Cob Sirerating scheme proves this, he topped the Section D`s on eight occasions and the Section C`s nine times, he has also sired two sirerating winners Nebo Daniel and Nebo Bouncer. May we as a family thank Brenin, not only for the succcess he brought upon Nebo and Tyngwndwn, but also for being a true and gentle friend.